Product Details: Copper cookwares are lined with Tin. While the Copper material is definitely a plus, the Tin lining helps to add extra durability.The pan is heated and expertly lined with heated layer Tin, then cooled so the Tin sticks to the Copper. Therefore handmade Copper pan line with Tin can never have perfect inner layer. You may see some dark spots inside the pan and it is 100% normal. Caution: Many Tin lining tends to thin out over time and copper can eventually show through. 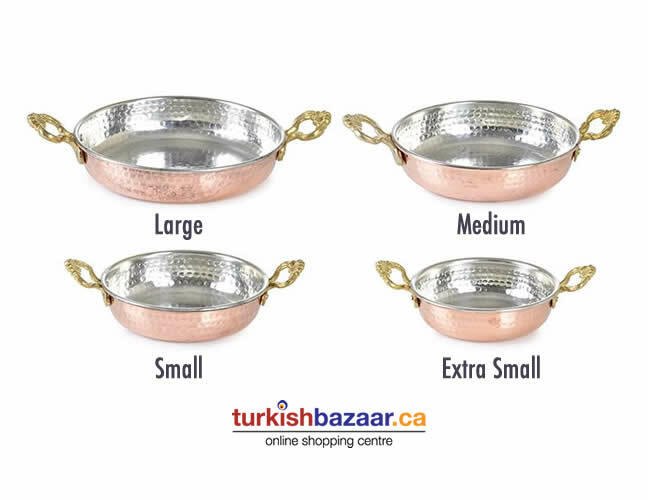 When it does, Turkish Bazaar strongly recommends not to use the Copper pans to avoid any health risks. 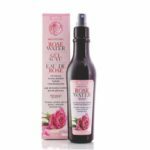 Category: Boxing Week Sale, Food, Gift Set, Kitchenware, Pan, Soup, Jam & Paste. Tags: Turkish Coffee Pots. 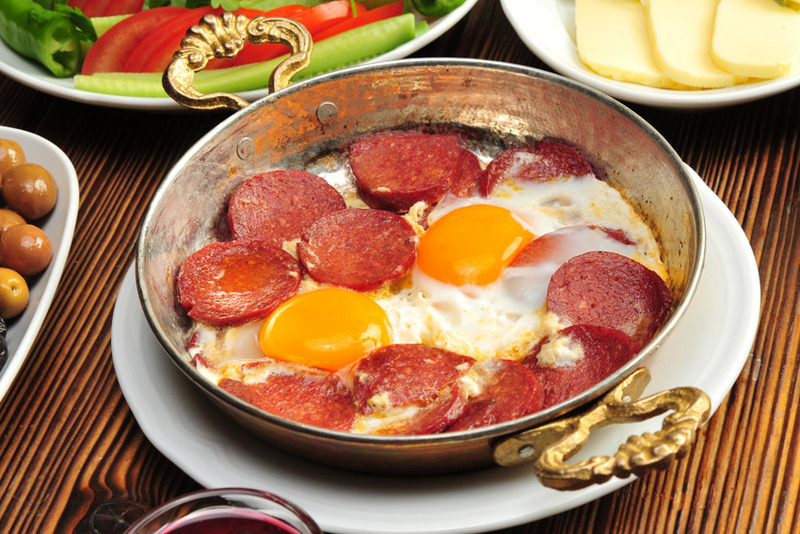 What Are The Benefits Of Copper Pan ? If you are wondering why copper cookware is fast becoming the favourite choice in kitchens all over the world, then all you need to do is take a look at the advantages this type of kitchen cookware offers. Once upon a time, steel was the best looking of the lot and people were clamouring for it. Today, copper is the winner because its advantages have been discovered, which means people now consider it to be good value for money spent. For one, all copper utensils, whether fry pans or pots, are excellent energy savers. It does not matter what type of heat source you use in your kitchen, if your cooking is done in copper pots and pans, then there will be plenty of savings for you. Chefs love copper cookware because it enables them to cook sensitive foods without any worry. 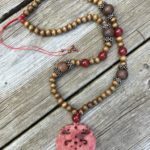 This material heats evenly, regardless of the heat source and therefore the danger of getting your recipe burnt when left for prolonged time on the stove, is minimal. Great for making omelette with sucuk or pastirma but also for all purpose cooking where a pan is required. Enjoy your new meals cooked with your copper pan ! 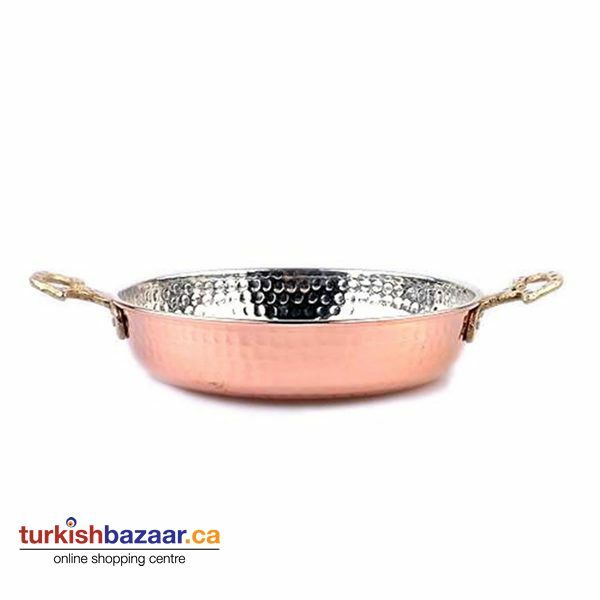 Product keywords and available city/states: Turkish Copper Pan, where to buy turkish copper pan, bakir sahan in Canada United States,Canada, United States, Toronto, Mississauga, Montreal, Calgary, Ottawa, Edmonton, Mississauga, Winnipeg, Vancouver, Brampton, Hamilton, Quebec City, Surrey, Laval, Halifax, London, Markham, Vaughan, Gatineau, Saskatoon, Kitchener, Windsor, Regina, Richmond, Richmond Hill, Oakville, Burlington, Oshawa, Catharines, Cambridge, Kingston, Whitby, Guelph, Ajax, Thunder Bay. 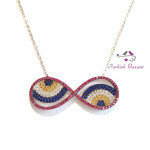 Vancouver, Milton, Niagara Falls, Newmarket, Peterborough, Sarnia, Buffalo, Fredericton, Alberta, British Columbia, Manitoba, New Brunswick, Newfoundland and Labrador, Nova Scotia, Ontario, Prince Edward Island, Saskatchewan, Northwest Territories, Nunavut, New York, Los Angeles, San Fransisco, Arizona, Washington, Florida.